This gorgeous space wallpaper, taken in the Atacama Desert in Chile, shows star trails circling the South Celestial Pole, over a cacti-dominated still landscape. This gorgeous space wallpaper, taken in the Atacama Desert in Chile, shows star trails circling the South Celestial Pole, over a cacti-dominated still landscape. 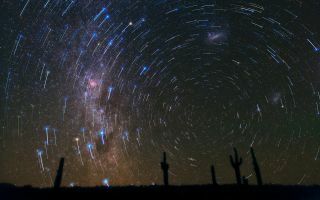 The star trails show the apparent path of the stars in the sky as the Earth slowly rotates, and are captured by taking long-exposure shots.